Peachy Beachy time at Amitie. 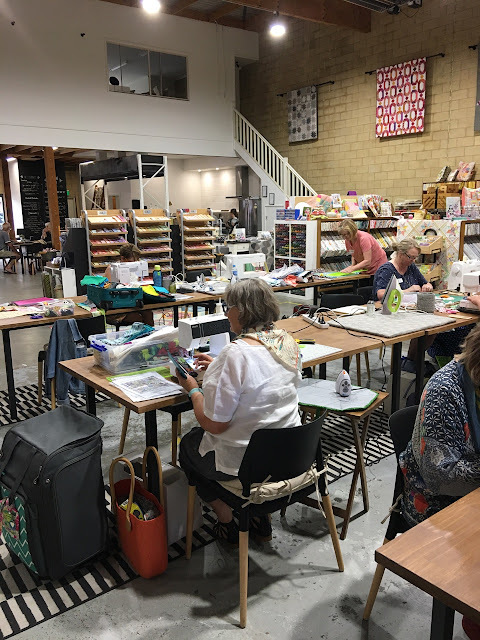 Last weekend I had the most wonderful time teaching my WhizzBang workshop at Amitie Textiles. As usual I have a ton of photos, so make yourself a cup of tea and settle in. For those who may not know, Amitie is not only one of the leading quilt shops in Australia but is also regarded very highly internationally. People travel from all over the world to visit this wonderful shop full of colourful, fun and quirky fabrics. 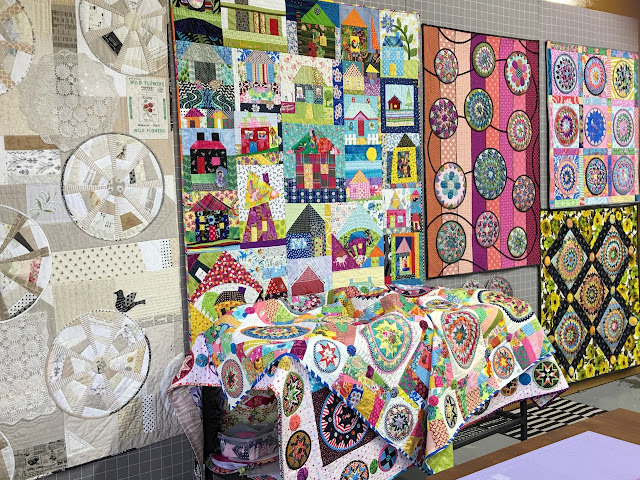 It is owned by Jen Kingwell, who is a very well known quilter and quilt teacher. She's so down to earth that she'll laugh if I call her a Super Star Quilt Designer & Teacher but she is!! 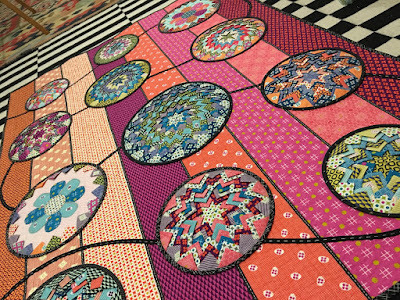 Her distinct designs are much loved by quilters and sewers all over the world. Quilts, quilts and more quilts!! 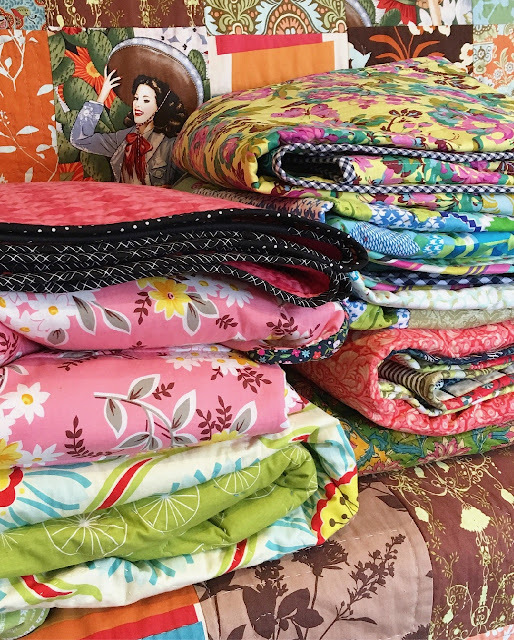 I took these photos when I was picking out which quilts to take to my weekend workshop at Amitie. 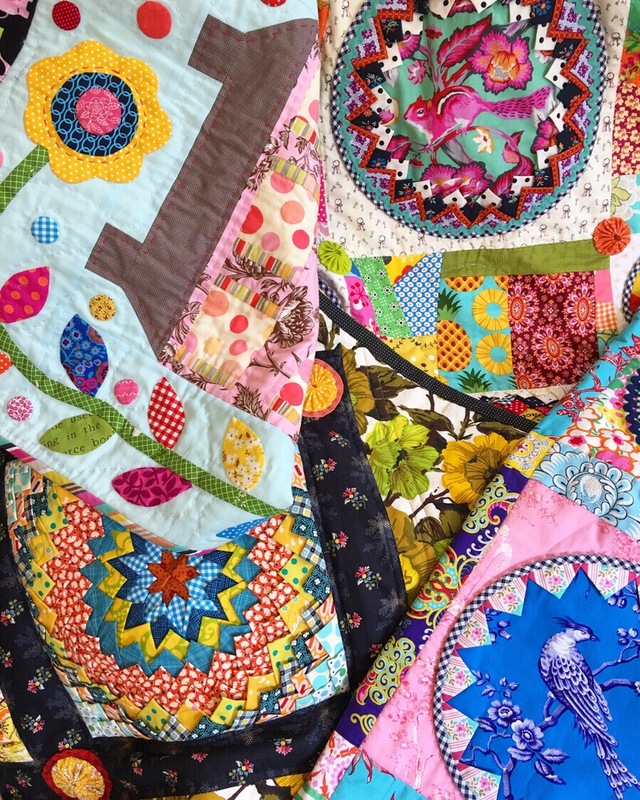 I just love seeing quilts in stacks, all that colour upon colour, pattern on pattern. It's when they're folded like this we get to appreciate how pretty the binding and backing is. I actually managed to fit quite a few quilts into my suitcase. It was jam packed but came in slightly under the allocated weight restrictions. Absolutely perfect. I really do feel as though lucky angels watch over me. I flew down on Friday. Jen Kingwell was there to meet me with a lovely warm smile and friendly conversation. 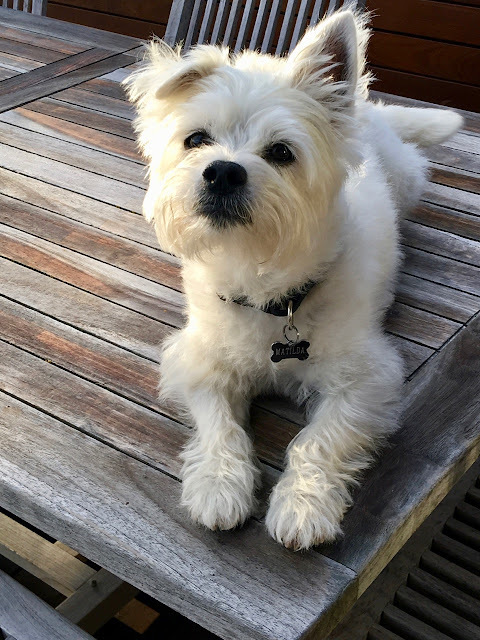 Jen and her husband Richard made me feel so welcome, and treated me like a VIP from the moment I arrived, though it was really Tilly the WestieX who was president of the welcome committee with her sweet face, waggly tail and enthusiastic furry kisses. 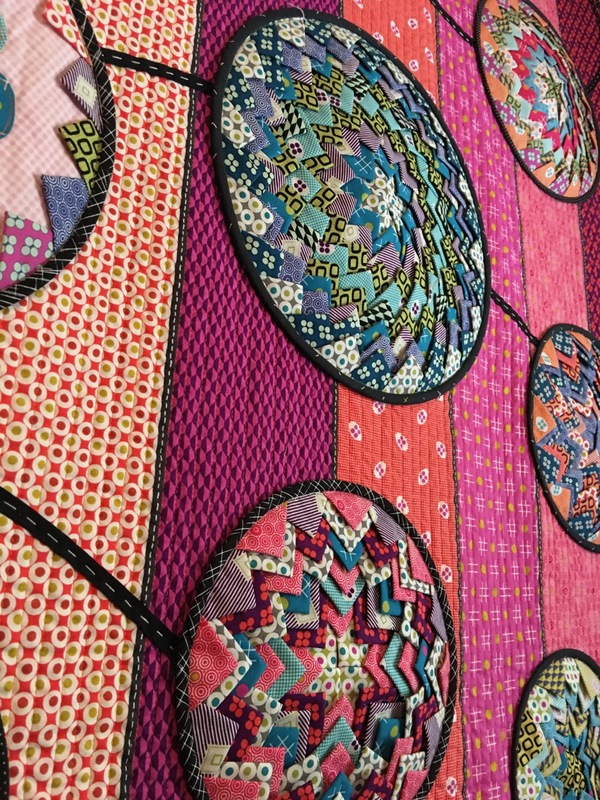 Of course staying with a quilter means that there is a quilt on the bed, and this one was a beauty, the sort of quilt that captivates you with it's colourful scrappy mix. On Saturday morning we arrived at the shop bright and early. The shop has been in it's new location in Torquay, for 8 months. It's easy to see why Jen decided to relocate. 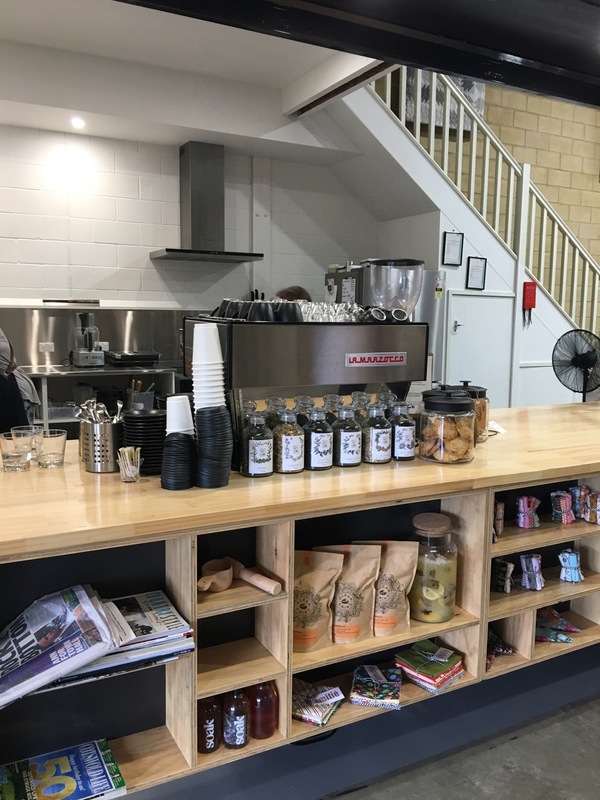 The new shop has all the benefits of size, easy parking, a beautiful coastal location in a lovely town and is just an easy hours drive from Melbourne. Of course it's hard to capture the atmosphere in photos especially as I was taking photos early in the morning before people arrived. You can help me out by picturing people meandering through the aisles with bolts of fabric, ooh and ahhing over the eclectic range of fabrics, sorting through pre-made fabric packs and picking out patterns. There was great music playing in the background! Those sort of tunes you cant help but sing along to. A shout out to the wonderful staff too, genuine friendly, helpful service with a smile!! 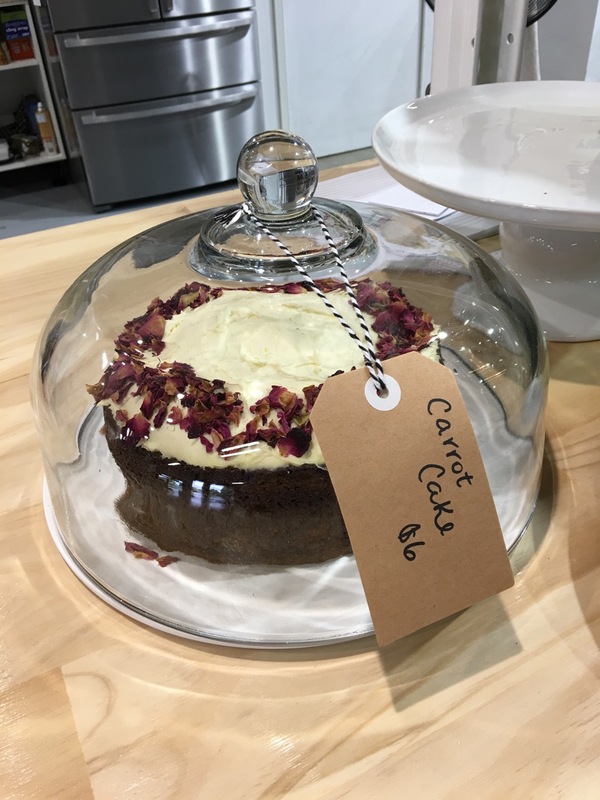 You are greeted by the delicious smell of coffee and in house made cakes as you enter. The cafe is getting quite a reputation for it's outstanding food and excellent coffee. Lots of locals are regulars and of course it makes a visit to Amitie perfect as a road trip destination. Everything we ate over the weekend was above and beyond delicious. 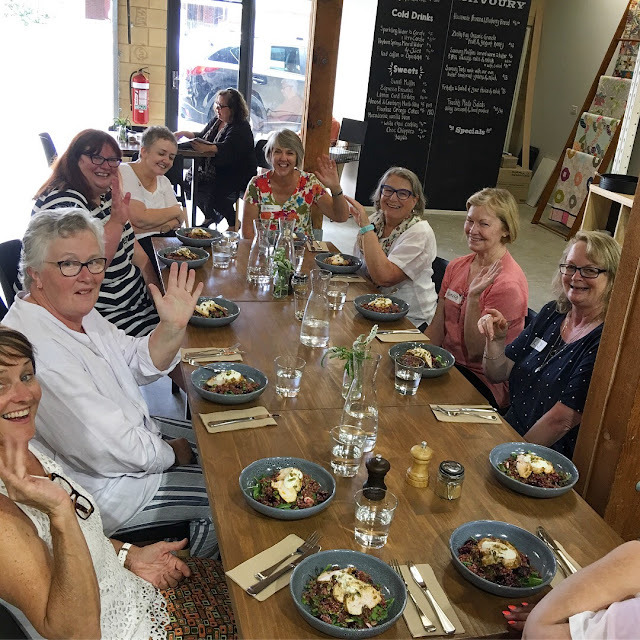 As part of the workshop participants were served sweet treat and coffee for morning tea, and then there was the delicious lunches.. yummm. 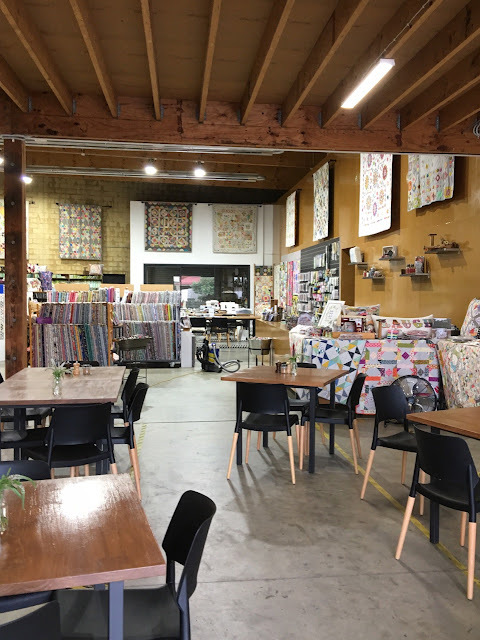 From the cafe the lure of the fabric beckons. 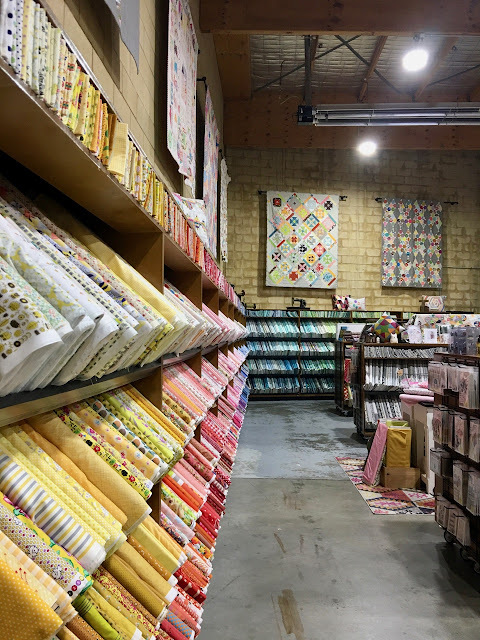 Walls lined with bolts of fabric, a textile rainbow delight!! Note all the amazing quilts hanging high amongst the rafters. It really is a sight to behold. Everywhere you look there are beautiful things to admire. An endless supply of luscious Liberty. 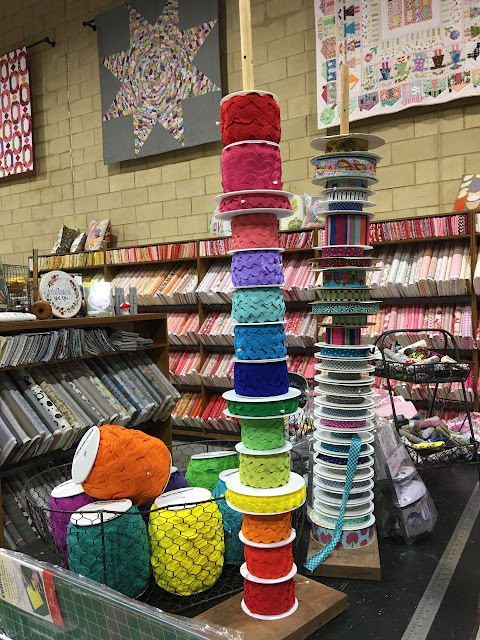 Aurifil thread in every colour! Of course I loved this tower of ric rac!!! Thank you to Jen's husband Richard for helping me set up my quilts. They fit perfectly on the design wall. 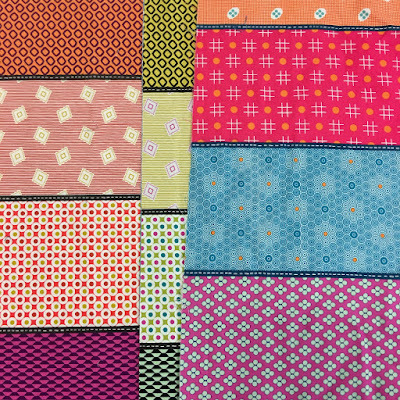 I like to take a variety of quilts to show different ways of setting the Whizz Bang blocks, and to inspire different colour ways. Then it was time to meet everyone. 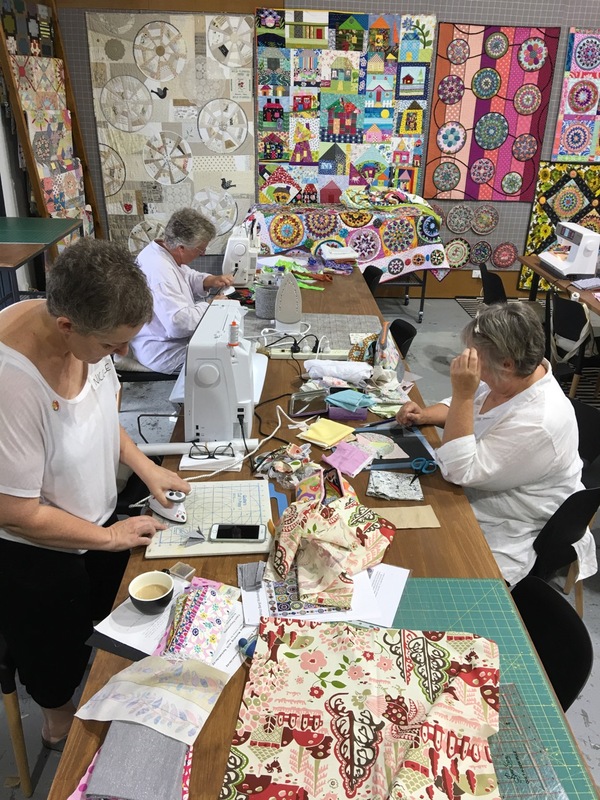 We had THE loveliest group of quilters. So friendly and enthusiastic. 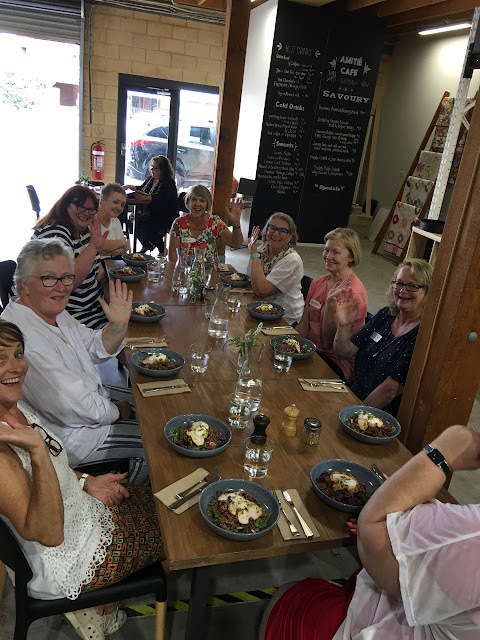 Many had travelled far and wide from places all around Australia. ( I think they'd heard how good the coffee was). It was great that Amitie was able to lend sewing machines to those who had flown in from interstate. And here's the class in action. You can see how spacious the work area is. Lots of room to spread out and ironing stations on each table. It worked really well having the workroom in the shop. It was so easy to see what was needed if a block needed another colour or fabric. 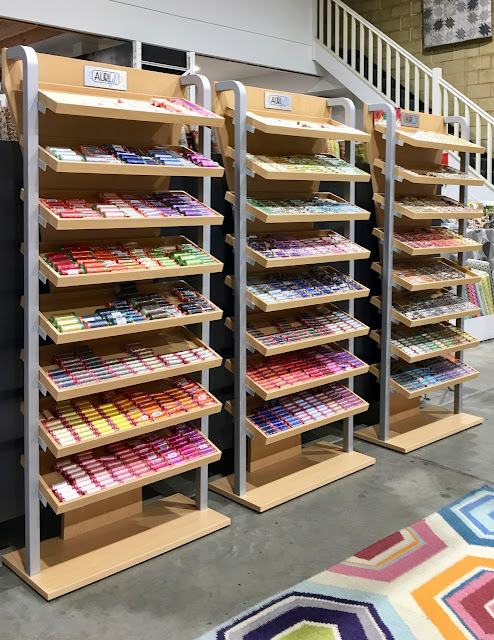 Plus wandering the aisles was a great way of stretching the legs and having a few minutes break from your work so you can come back to it with fresh eyes. It was lovely for everyone to stop for lunch and eat together. 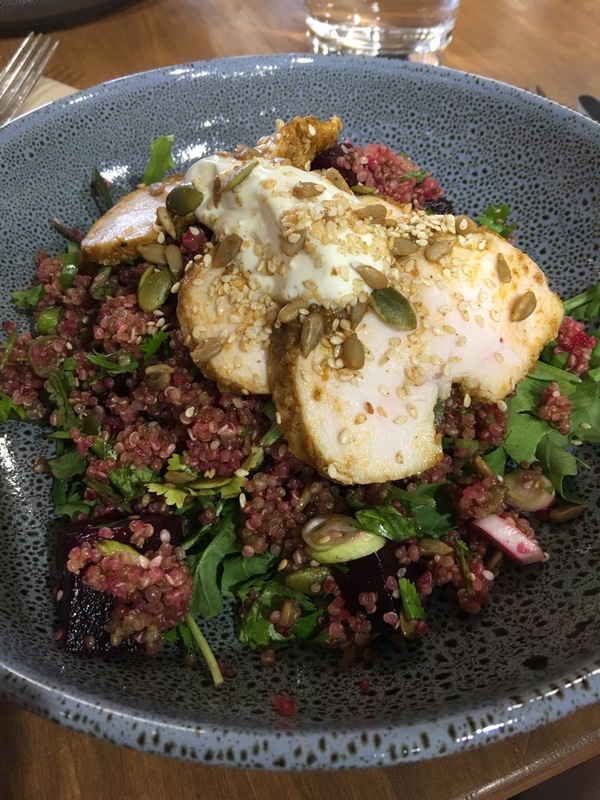 Saturday's lunch was the most delicious quinoa chicken salad with a lemon yoghurt dressing. I was so rewarded by the enthusiasm that everyone had for the blocks, the delight they had in choosing fabrics and realising how they work in these blocks. Everyone did such an amazing job!! 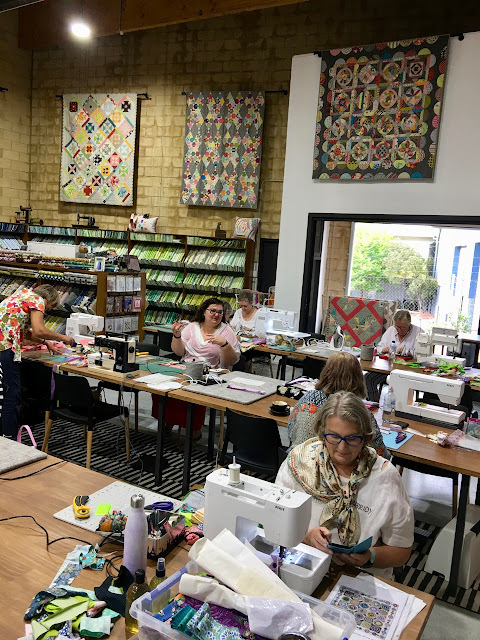 As always with classes it's fun to see the different fabrics people use. 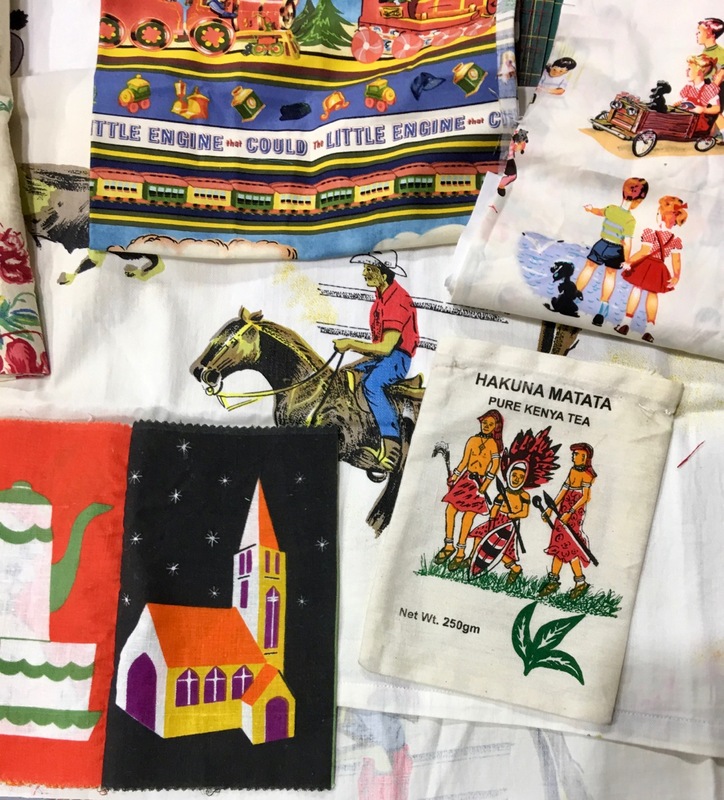 Loved these retro prints and vintage finds. 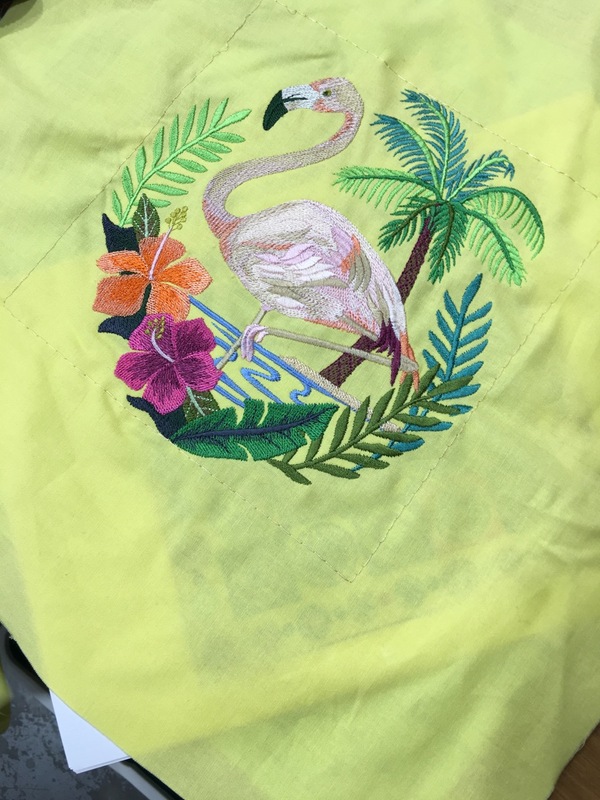 This beautiful embroidery became the center of a block. This selection was purchased from Amitie. 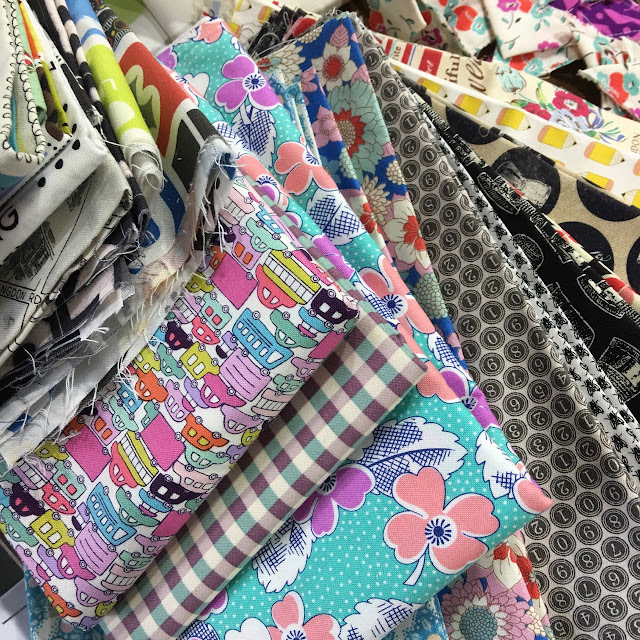 It's a great example of the fun and fabulous fabrics that fill the shelves. The two days flew by in a colourful whirlwind. By the end of the weekend everyone had made beautiful blocks and were coming up with the most wonderful plans for what they wanted to make with them. 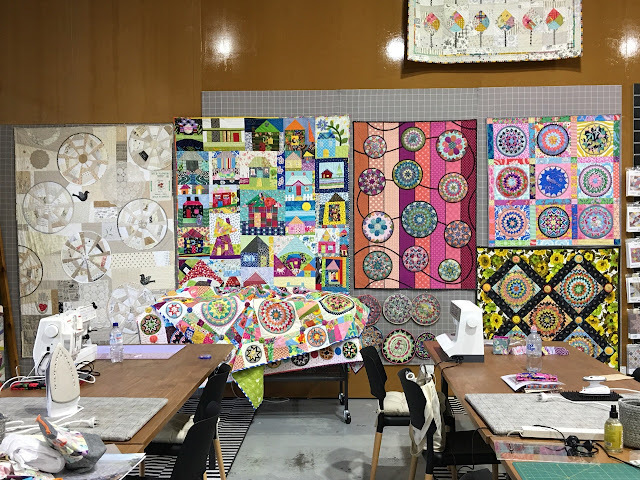 It's just a few days after the class and I continue to be blown away by the blocks I'm seeing on instagram made by members of the workshop. Big smiles at the end of the day. We didn't stage this photo but how perfect that it looks as though Jen has a halo. It doesn't surprise me at all, she is an angel, an absolutely wonderful person. 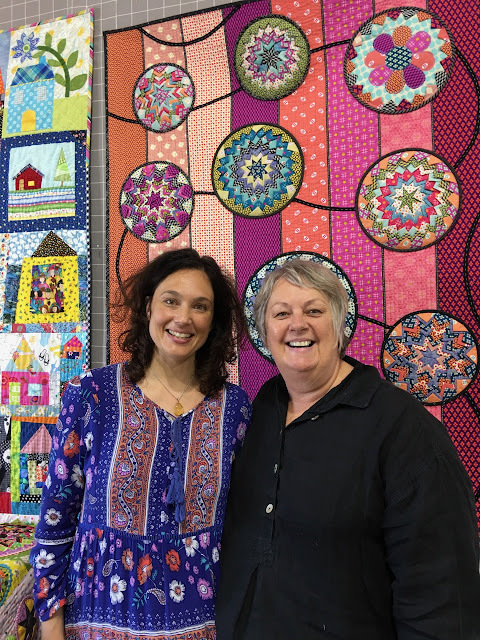 I so admire her beautiful quilts and the wonderful shop she has built up over years. It really is a special place. I feel honoured to have been invited to teach there. 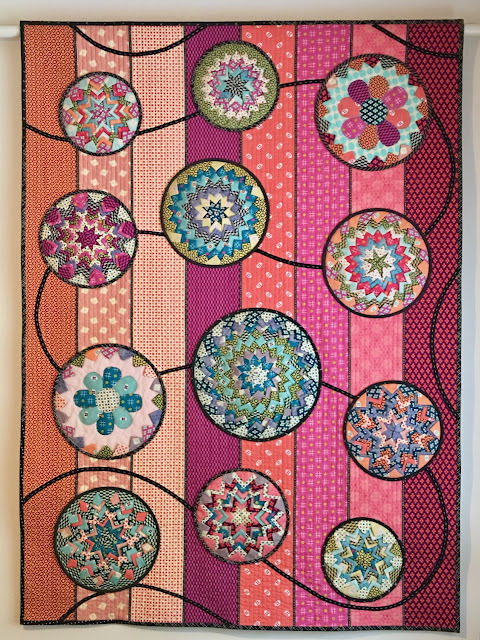 Some of the quilt spotters out there will notice that this is my new quilt made out of Jen's Lollies fabrics. I saved the full unveiling for the workshop. Here is a picture of the fabric. 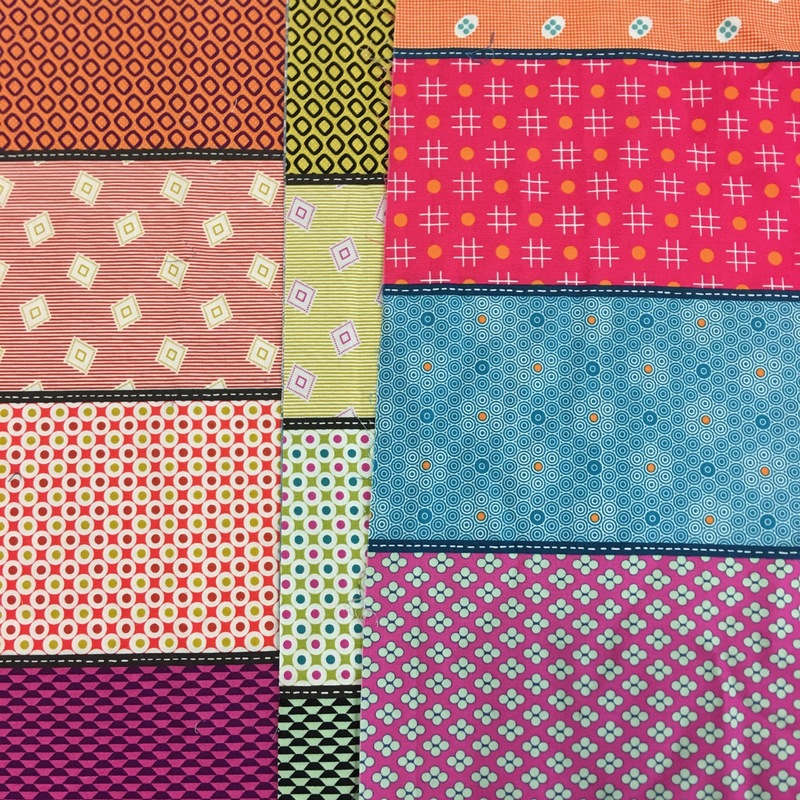 Lollies has wide stripes of 8 different designs across the bolt. It made it so easy to make these blocks because the colours work so well with each other and the scale of the designs are just right. It was an easy choice for the background too. I like that it's there to show the fabric that the blocks were made from. I took inspiration from the thin black lines between each stripe and added a skinny black strip winding its way behind the blocks. I think it helps make the circles look as though they are floating and moving. Mr Daisy says it looks like a little road, but then he's a car enthusiast so that doesn't surprise me. 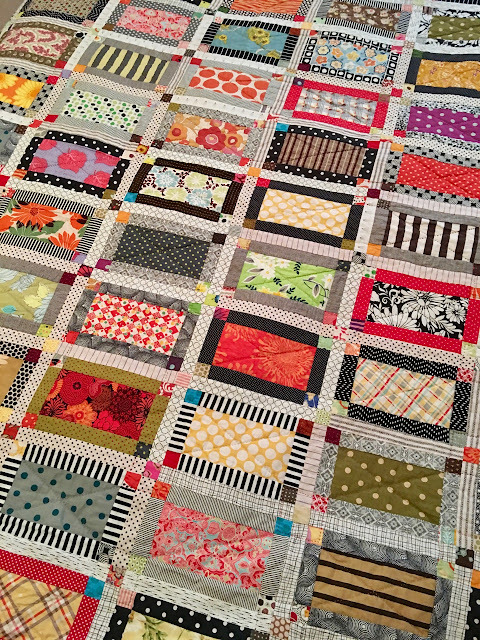 I quilted it with simple straight line machine quilting following the lines of the stripes. 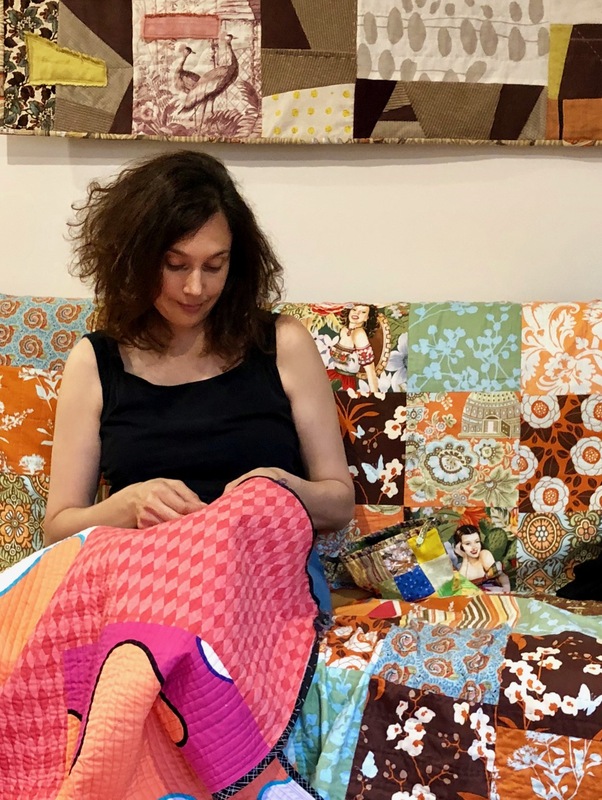 Here I am in a quiet moment sewing the binding on. 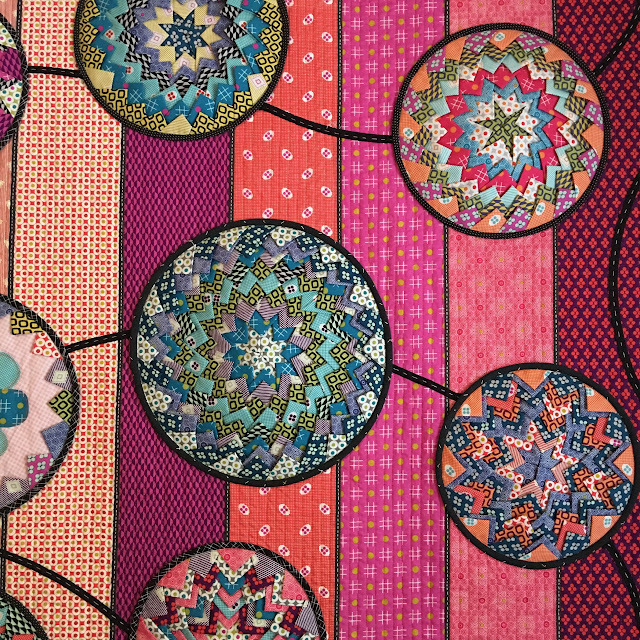 It gives you a glimpse of the backing, I used fabrics from my stash in similar colours. As for a name, I find I'm calling it Lollies Love. It sounds like an affectionate pet nickname. I've also thought about calling it Lolly Gobble Bliss Bomb after a yummy caramel popcorn snack found in Australia. We'll see which name sticks, that's how it happens sometimes. 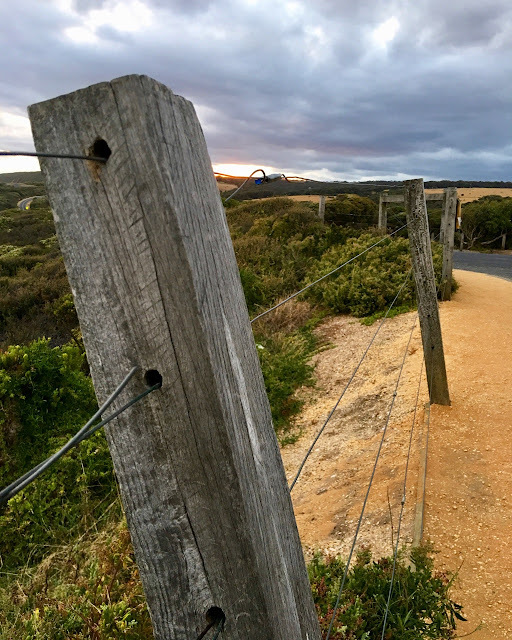 We went for a drive after dinner one night. 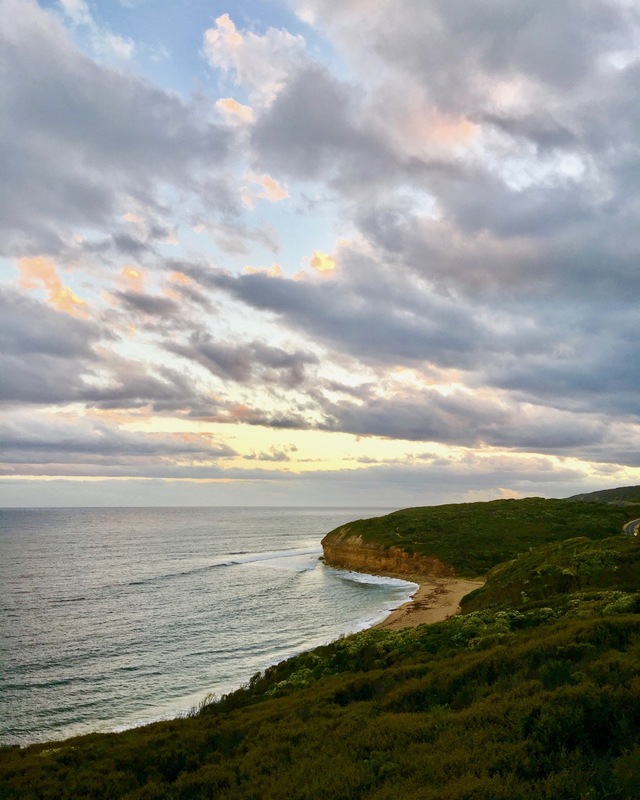 Spectacular views at Bells Beach. 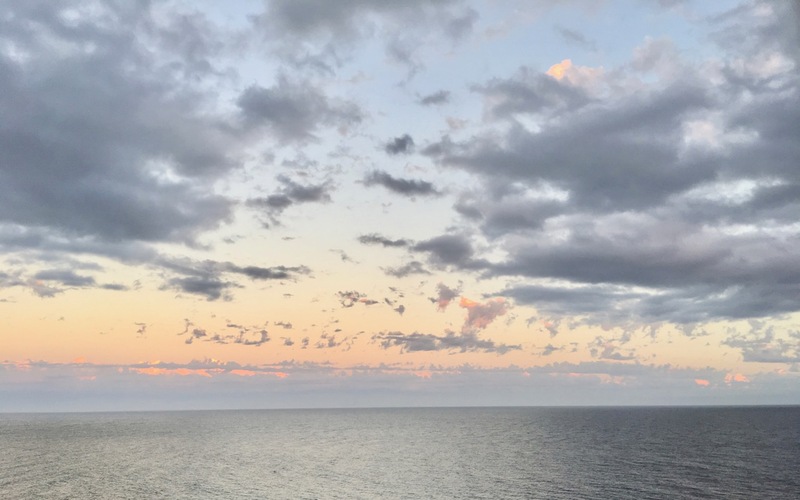 As you can see the clouds put on a special show for us. It just goes to show what a beautiful part of the world this is. So Wow!! That was my Amitie adventure. It was wonderful in every way!! 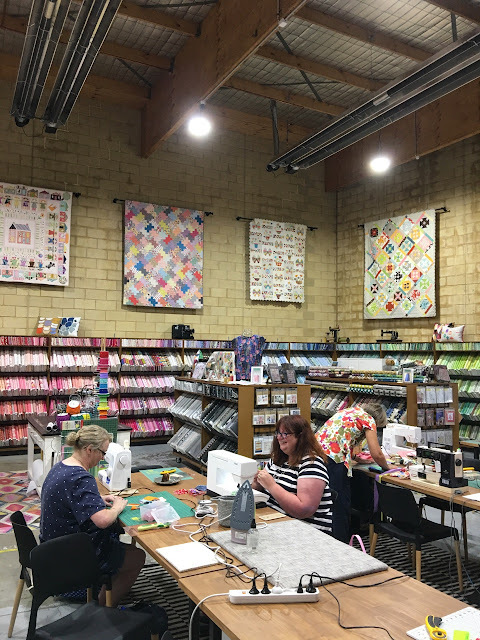 A super big thank you to all of those lovely quilters who came to the workshop and added their warmth and smiles to the weekend. And a special thanks to Jen, Richard and all of the Amitie team for making me feel so welcome. 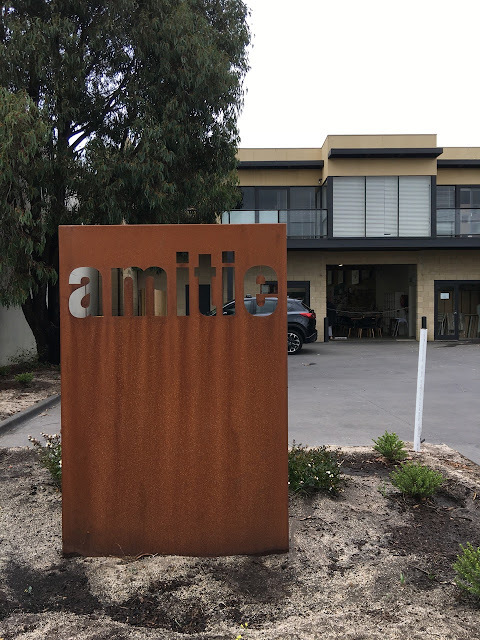 For more information about Amitie visit their website here. 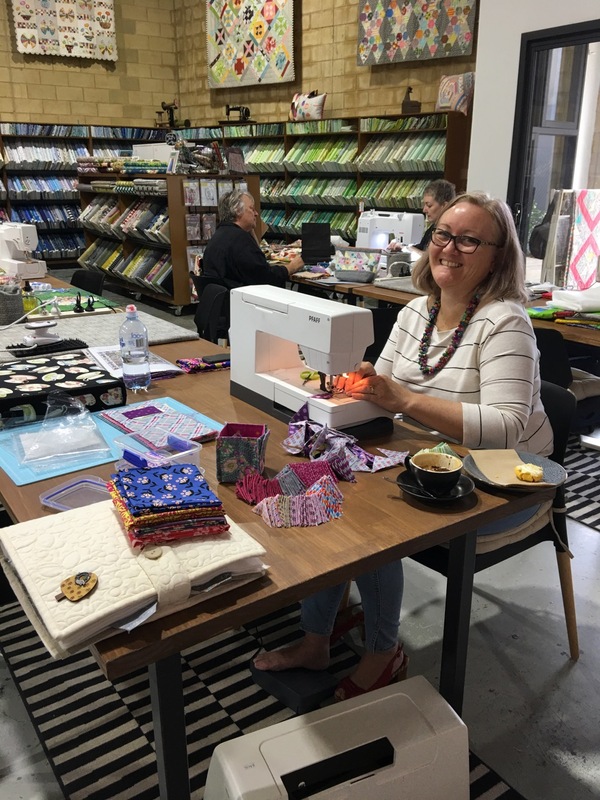 My next fun adventure is in Woolongong this coming weekend with the awesome Illawarra Quilters for more Whizz Bang fun. I'll be back with another round of colourful photos soon!! 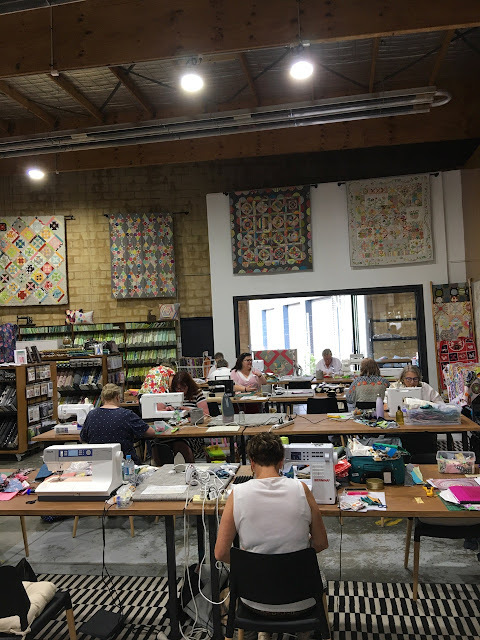 What a droolworthy venue for your class. It must have been so much fun. I always enjoy seeing all the different interpretations of your block. It's good you had a chance to see a little of the sights as well. Oh. My. Gosh! You Lucky Lucky girl! 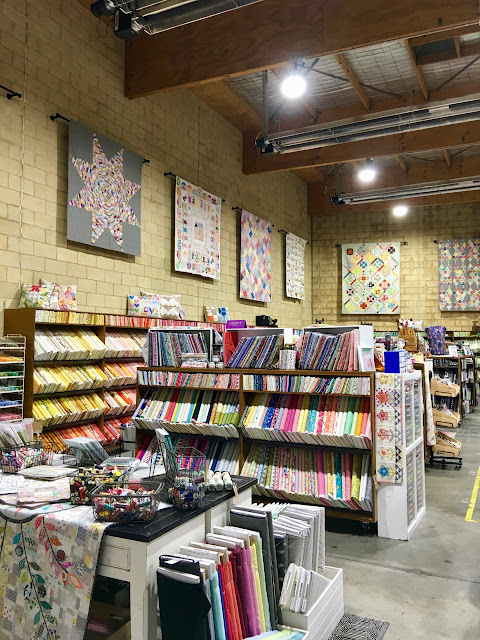 Your quilts look right at home at Amitie and it looks like you had a wonderful time. I visited Amitie at the old location, but I drool every time I see the pictures of the new location. Thanks for a super fun (and colorful!) post! Just how much fun can one have in a workshop? What a wonderful place to sew and share. 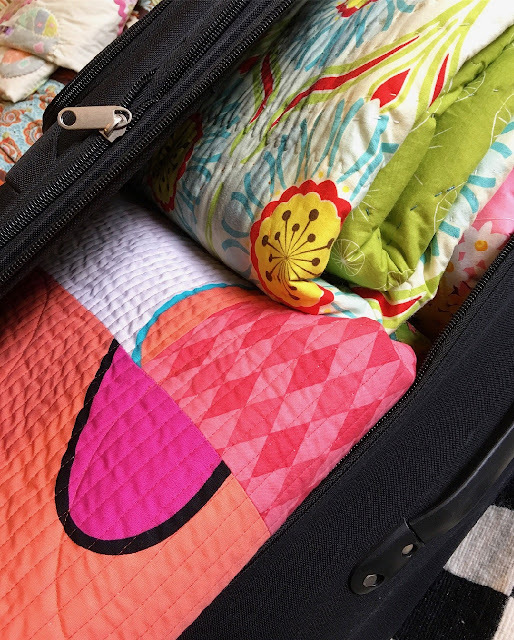 I adore your new quilt, but I must say I like the second choice name best. I think if I closed my eyes and you said, "Lolly Gobble Bliss Bomb" this quilt would instantly appear in my mind! And, I have serious shoe envy for Christine's red shoes!!! What an amazing space! It looks like Jen put a lot of thought into how she wanted her new place to function. I can see everyone had a wonderful time! What a wonderful view you have given us of that special place and time! 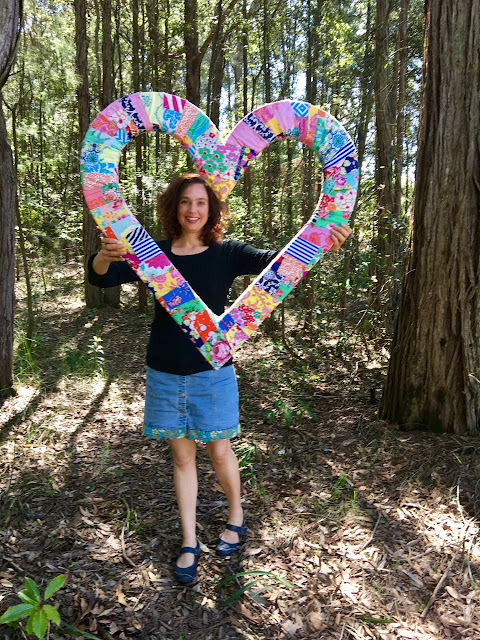 And I want to change my name vote...now that I have seen more of it, I like Lolly Love too....just the sweet flowing cadence of the quilt design...it IS lovey! Thanks for a lovely post!!! 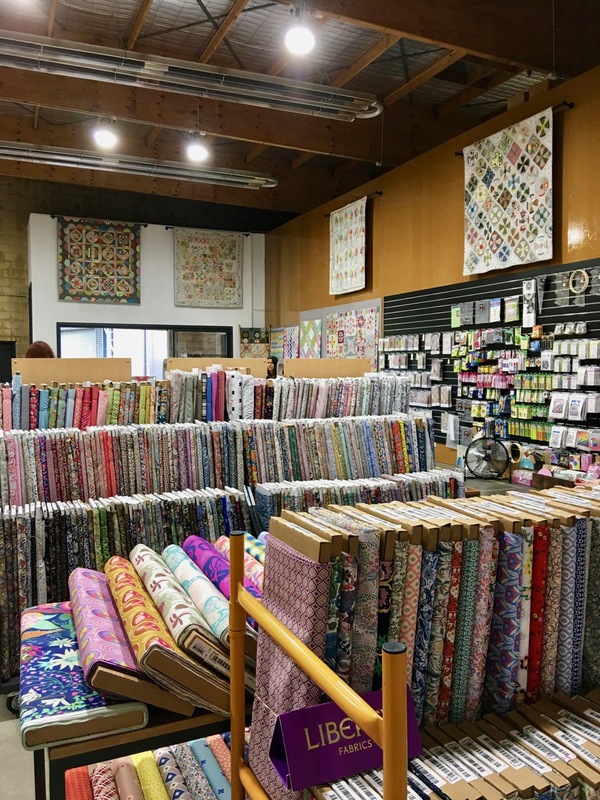 Thanks for taking us all on a lovely trip to an amazing quilt store! It's always great fun to see your class results and see all the creativity in progress. Your latest quilt is so gorgeous! Very bright and fun and just YOU! Beautiful work as always! Such a spectacular part of Australia. I'd been to Amitie in Gardenvale but am looking forward to visiting the Torquay shop one day. Looks like you and everyone had the best time. 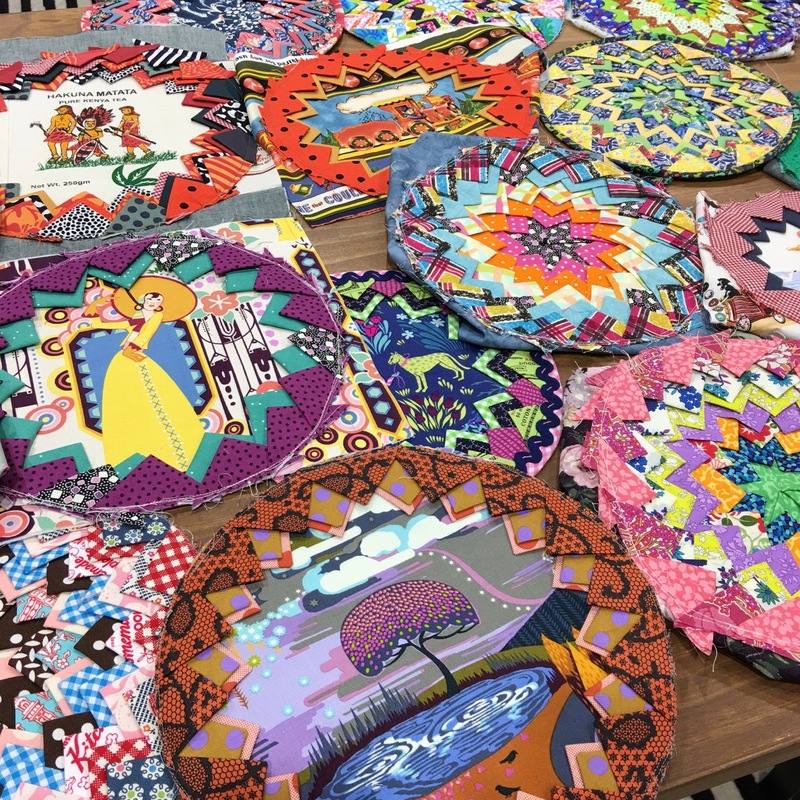 Such a great and colourful post Rachael ! This shop looks like a wonderful place and I regret Australia is so far away from home ;-) I'd love to visit someday and take a class with you ! It all looks totally wonderful Loved the photo of all your quilts on display together. That is something we don't get to see often. They always look wonderful. You must have been on cloud 9 with all that lovely fabric. And it looks like you had a great group for the classes. I couldn't make it over the weekend but was there on Tuesday for my first look. 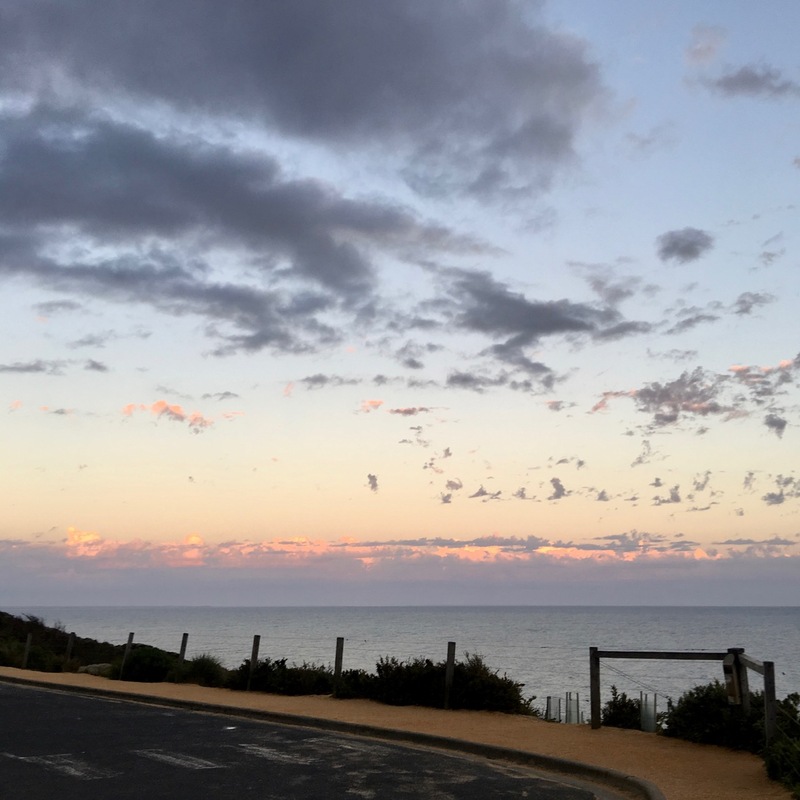 We were babysitting in Ocean Grove and went for a drive. So good to set hubby and grandie up in the cafe when I was looking around. Loved it and intend to return soon. I'm always full to bursting when I read your posts, Rachael! What a great time it looks like you had! And finally, an unveiling of Lollies <Love-- yes, I love it! Looks like a dream come true, both the shop and the class! what a colorful fun filled trip. 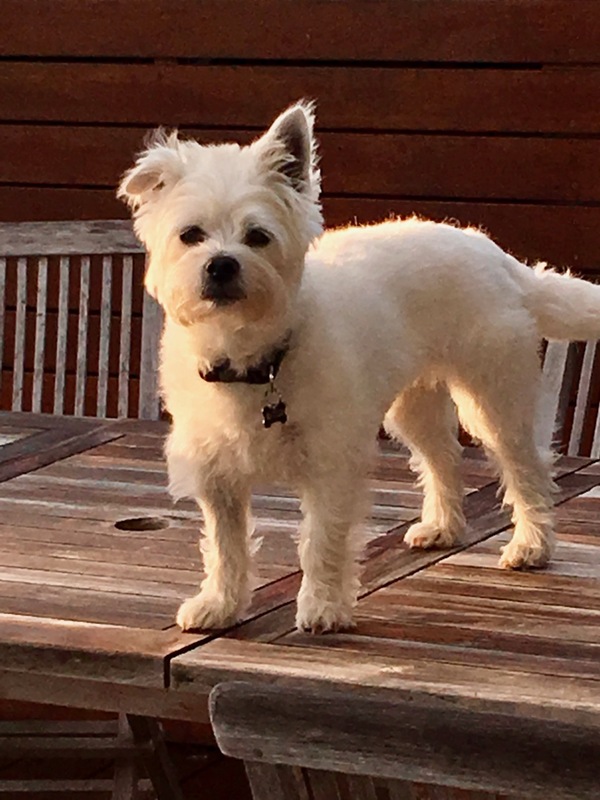 that little doggie is so so cute! 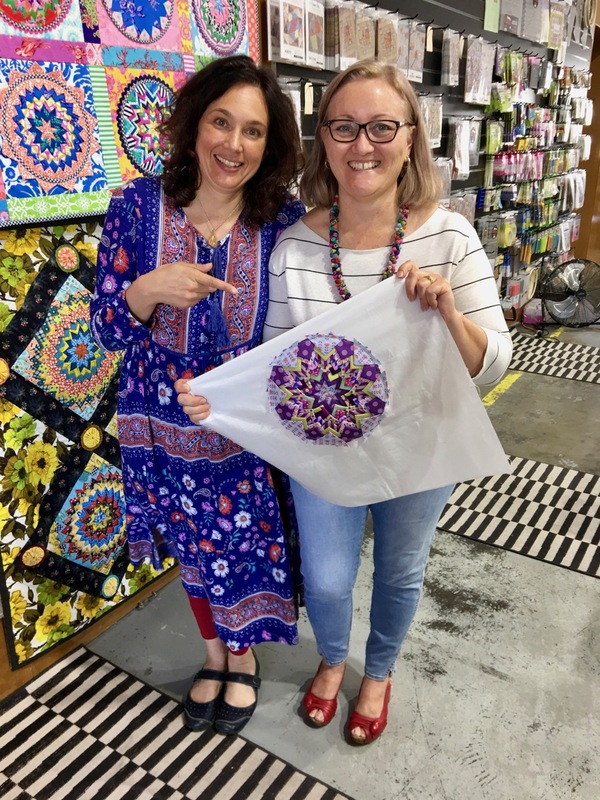 I'm so glad you're out traveling and teaching and bringing color into quilters lives.